If you are looking for a quick and easy way to stream online content and spoof or geo-shift your location, look no further than PureVPN's extension for Chrome web browser. PureVPN's Chrome extension is the easiest way to connect a VPN for web browsing. Google Chrome is the most popular web browser for both PC and smartphones – and no other browser even comes close. 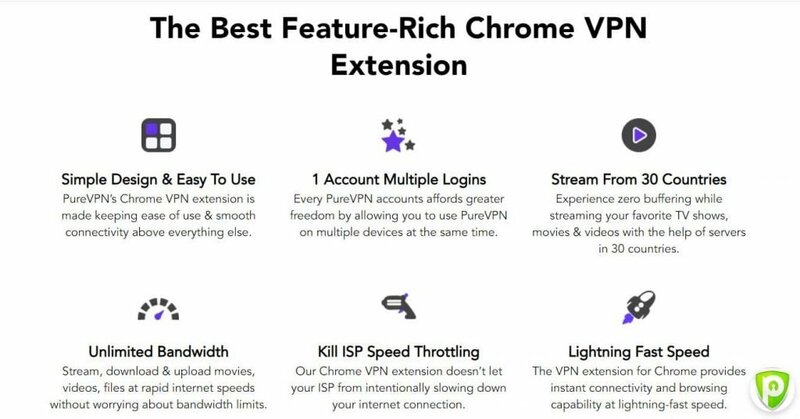 So, as a likely Chrome user, you might be interested in PureVPN’s top-rated Chrome extension, which makes using a VPN easier than ever. Keep reading to find out more. As you'll read below, PureVPN’s extension just makes everything easier to navigate for avid streamers. That’s probably why the extension has a 4.5 rating on over 1,000 reviews in the Chrome web store. How Does PureVPN’s Chrome Extension Work? Though PureVPN’s desktop app is already very streamlined and simple-to-use, PureVPN’s chrome extension seeks to make things even easier. 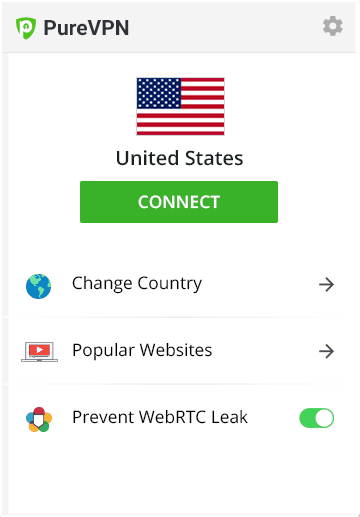 With it installed, users can connect, change countries, access PureVPN’s preset bookmarks for popular websites, and even prevent WebRTC leaks, all from within the very minimalist menu they’ve built right into the Chrome browser. So, let’s say you’re trying to watch Netflix, but you’re in a country that blocks access. Without even minimizing your browser window, you can connect to one of PureVPN’s streaming servers – and boom, you’re now able to stream through Netflix. And if you get tired of the Netflix catalog for, say, the US, just select ‘Change country’ from within the extension, reconnect, and now you have access to an entirely different selection of movies and TV shows. Or you can take advantage of the extension’s bookmarks to specifically access Netflix for different countries, like Netflix UK, quickly and easily. And this works for all your favorite streaming services, from Hulu to Amazon Prime Video. Of course, as with any VPN service, you’ll also be able to stream without worrying about bandwidth limits or speed throttling imposed by your ISP. That’s because your data is encrypted and routed through the VPN tunnel, which makes it both more secure and harder to monitor. But you will need a PureVPN subscription to use their extension. If you don’t already have one, you can get an exclusive discount through Cogipas if you sign up today!